Add this Choice 7 1/2" unwrapped black stirrer / sip straw to your venue to ensure your customers can conveniently stir and enjoy their hot beverages! The straw features a single barrel for easy sipping and has a sleek, black color that will add a classic touch to your coffee shop, diner, or restaurant. Plus, it comes unwrapped, allowing for quick placement in piping-hot coffees, teas, cappuccinos, and hot chocolates without the hassle of uncovering traditional paper and plastic wrapped straws or picking up dropped wrappers within your facility. Pretty standard for a coffee stirrer. I will say that the design could be better for its intended purpose though.Once put into hot coffee they become pretty flimsy and our customers usually grab two in order to mix their coffee enough to dissolve sugar at the bottom of their cups. Shame we had to buy 12,000 to find out something else would have worked better. These straws are a perfect addition for drinking and stirring drinks. I think they would work well with cups 4 inches and up. Good quality, no issues. Perfect size for our Sunday morning cafe. They come in nice boxes that stack easily for storage. We use the 12 oz cups item #50012W and these are a great match. These are great for coffee or tea. The box was damaged when I received it. But the product is really good. For the price and quality, it is definitely worth it. never had a problem with these black stirring straws. great for a coffee shop. i rarely have to order these due to the large quantity they come in. The Choice stirs are just as good as the name brand stirs and they are less expensive. They are great with taller cups. We definitely recommend these stirs. These are great and sturdy coffee stirrers for all your coffee, tea, and hot cocoa needs. We have only used these and is our preferred choice in stirrers at our restaurant. A great price too! Really love these stirrers. They don"t have the woody taste of the wooden ones. They have a nice firm quality that stands up in hot drinks. The size and quality are great. We used these for a hot cocoa and coffee bar setup. These worked well with our 8 and 10 ounce cups. These coffee stirrers are an excellent value for the price. They are not as cheap and they don't bend as easily as most of the other coffee stirrers do. These are sturdy and a good for hot beverages for small or large sized cups. The black color makes the drink look more professional and serious. The fancy appeal makes it perfect for mixed drinks. The length fits perfect for most cups sized 10-16 ounces. The diameter is enough so you only need one per drink. This straw is longer than a typical stirrer, which is great for 16 ounce cup sizes and larger – they don’t fall under the lid or below the liquid level! It’s thinner than a typical straw for sodas; it’s more like a milk straw, but it’s perfect for coffee and tea. These coffee stirrer I would say its just okay. A little too thin for my taste, but functional enough to do the job. Just would like to be just a tad bit sturdier. A nice tall unwrapped coffee stirrer that is great for our large cups. The stirrer is well priced and a great quality. A nice addition to our coffee bar. These stirrers are sturdy enough to only need one. Customers used to use several of the previous ones I had. They are long enough for people to use to sip drinks with. These weren't as sturdy as I had hoped but then again I was trying to use them to mix up powder mixes in cups which was probably more than what they could handle. If you were just stirring up your drink they worked perfect or mixing in a syrup or creamer... They worked perfect for that as well. 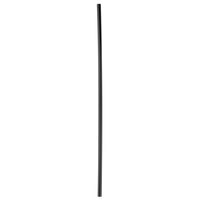 Choice 7 1/2” black unwrapped coffee stirrers! There are 1000 straws in this box. I use them for my coffee. To evenly blend the creamer with the coffee. The price is right, the shipping is timely. The length is great for our 10 ounce cups. The are also a great help to test a hot beverage. We will be reordering. A very reasonably priced coffee stirrer. This box contains 1000 7.5" straws. They are in the color black. Get this product shipped directly to your door. We do love this site. Fantastic product. We switch over because supplier was more expensive. Well made doesn't crack or unintentionally bend. Stirs well even with ice in the glass. I would recommend this product to anyone. These are really nice coffee stirrers! I thought they'd be little dinky things but they're nearly straw size. Very good quality stirrer and I'm glad we chose to try them. Will definitely be reordering them! Coffe stirrer is a must at a coffee shop. This item have a great quality and comes a lot in a single box. Average size of straws. Why buy small quantities of stir straws from your local source when you can buy bulk for the same price and save money. We love the quality and service from Webstraunt. The Choice 7 1/2" Black Unwrapped Coffee Stirrers / Sip Straws are great for hot or cold beverages, I use them for coffee and soft drinks. The quality is pretty good for the price. I am very happy with my purchase. Nothing fancy about these but these are a good value overall. Will continue to purchase these in the future. This is a nice length as well. I have bought this product together with the 5" coffee stirrers, I consider these are good for large size coffe cups and also for can sodas. These are a great addition to our coffee window. Great price and love the bulk amount. This is a great purchase! Every coffee cup needs a great stirrer! These coffee stirrers are perfect! I ordered a case to use for my wedding for our coffee bar and mixed drinks. 1 box would have been enough but you can't beat the price of the case! I already opened a box and they are quality stirrers/straws. I highly recommend. These black coffee stirrers work well. They are 7 1/2" in length. These can be used for tall glass drinks as well. Great quality straws. Great value on this coffee stirrer/sip straw. The 7.5" length is more versatile for larger to go coffee cups. Strong quality that stirs up sugar, and cheap enough for single use. The longer length of these stirrers is so great for large hot and cold coffee drinks. They can also double as a straw which is fantastic! These are quality stirrers, and they are a good length for all our cup sizes. They are not flimsy like some we have used, and the case price is a good value as well. I like these vogue looking straws that also double as stirrers. They are firm and are just the right size to effectively stir any drink. This item efficiently serves the purpose. you can't screw up a coffee stirrer like this. it's good for every size cup we carry here. you can stir in some cream and sugar or just sip on it when it cools down. good stir stick. These are used regularly in our coffee shop. We switched from red to black and we think it keeps a cleaner appearance. The kids love to drink their hot cocoa with them. Great coffee stirrers at an extremely economical price! We use these in our shop for coffees and teas, instead of leaving out plastic spoons. This helps cut down on the amount of plastic waste, and cost, since these accomplish all the stirring needs, at a much lower cost. I was surprised at the quality and size of theses coffee stirrers / sip straws. This works good with small or large cups, good choice. Great coffee stirrers for those looking for a classier look than the neon or the red and white stripe. Very functional and well built along with being sharp looking. Choice is a trusted brand. This stirrer/sip straw does the job. Comes 1000 in a box. We give 4 stars. Ge it from here, the Webstaurant store! These are great coffee stirrers. We also use them in mixed drinks as well and they are great. I would highly recommend these for both of those uses. These stirer sticks work great as well as providing the break off tab to stick in the top of hot coffee lids. They end up being a little more pricey than just plain Straight sticks, but it does add a touch of class to send out a drink from our coffee shop with the tab inserted into top of the lid. These 7.5" black straws/stirrers are great for coffee or cocktail drinks. Long 7.5" straw is great for larger mixed drinks or sodas. Great for bars or restaurants. No complaints about these coffee stirrers. These are good coffee stirrers and will fit all size cups well. I will purchase these again as needed. Purchased these for my coffee bar at my wedding, Theyare dual use, they can be used as a stirrer or a straw. I have even taken them with me to work to use to sip my hot cocoa. I love them ! These coffee stirrers are wonderful, they are a great price for the amount you receive. They work much better than other stirrers we have tried before. They are sturdy and mix thick sauces very well. These straws are very well made and work well for their purpose. Color looks great and they are durable. They were a bit too tall for my 12 and 16 oz paper cups, so next time I will be ordering the shorter ones. These are a nice longer drink stirrer. The longer size is nice, so that they can be used in larger sized cups. I also like the width of the straw opening because it allows it to be able to be used as a straw if you want to use as such. Whether you run a coffee shop or a bar or just need them in the office break room these stir areas are a must have. Might as well stock up and buy the big box so you never run out. We opened a bar two weeks ago, and I have already placed my second order of these straws! Exactly what any bar needs for their tall glasses! Choice 7 1/2" Black Unwrapped Stirrer / Sip Straw - 10,000 / Case - perfect for need. not too flimsy - not too sturdy. Does a great job and displays well. So many in a box. These are sturdier and longer than the stirrers you get at the coffee house. They are nice looking. I have already used some and feel like they stir my coffee well. Some that you get feel like they will melt not these though. Nice thing about the 7 1/2 choice stirrer is that they reach the bottom of all the cups we have. No worries about it falling in and fishing it out of a hot cup of coffee. my job has mutiple coffee stations and each station has got the small stirrers that don't work well when using larger cups or tumblers. I bought these to replace the small ones from our area, and they work great! Use these at at catered coffee fellowship at our church they perform well and are priced great. Better then some alternating ones we tried as these do not fold and bend as easy. The 7 1/2" Black Sip Stirrer is nicely made and would probably be great for just mixing hot beverages. They work well for stirring mixed drinks in highball or Collins glasses, but are a bit thin for sipping drinks. Can't bet the price. Needed them for a open bar at my wedding and it can fast with my other items. Thank you for your website! These stirrers look great with out white hot cups. Great stirrer, great value and good quality. Great addition for our coffee station! High recommend this product. I prefer these black hot beverage stir sticks to the wooden ones. No little wooden spikes from the stick to worry about. They get the job done and are very economical. These straws work very nicely for our coffee stations. They are just as good as any we have gotten anywhere and the pricing is great. Great stirrer, great value and good quality. They do not get flimsy when stirring a hot drink. Any other website you will be paying double the price. Definitely worth purchasing here. These are the perfect size for the 12 and 16 oz paper cups. If using sauces to flavor coffee products as opposed to the thinner syrups I find they area little flimsy and take a lot of work. These work great on my 12 oz coffee cups. They are made of sturdy material. Easy to grab and easy to stir sugar in coffee. The prize and quantity per box is great. Very useful! I highly recommend these stirrers. Our customers love having the convenience of a simple stirrer for their hot beverage. They are a necessity when selling coffee. Everything looks so nice in black and this stirrer looks great, and does exactly what it is supposed to do. And at a great price! I use these every day when stirring my coffee. I keep them by my coffee station and it makes the morning coffee routine quick, easy and great cleanup. I am a huge fan of these stirrers! Can't beat the price or quality of these stirrers! They work great for both hot and cold drinks! Not the typical flimsy stirrers that warp once placed in a hot beverage. The price on these was so good, I ordered them for my wedding so people didn't have to use spoons to stir their coffee. (We are having a coffee bar). Shipping was fast and these were exactly what I needed. its what you expect and I receive no complaints my coffee shop over the quality. I plan to order these for now on for our stirrers. This product is at a very good price point and unfortunately, a must have in the line of products necessary for serving coffee. The utility is as expected. In a busy office setting with long days & lots of visitors, coffee is essential. I like to think of these as straws that just happen to double as stirrers. For the double functionality, and the perfect height, I love this item! Nice sturdy stir straw, doesn't bend when you hit the bottom of the cup. Long enough to stir a 20oz drink, without your fingers in it. We use these stir straws for coffee beverages, mixed drinks at the bar upstairs, etc. For the money, these are worth buying! You will go through them. Perfect size to stir a large cup of coffee without getting your fingers in the cup and they are great for stirring mixed drinks as well as being used as a straw for them. So glad I found these, I was using the wooden ones for the customers, but some people like to drink their coffee through a straw, strange but each to their own. They work for us. These are stir sticks so what can you really say about them. Cost effective, lots in a package, and convenient packaging. They get the job done. Doesn't get flimsy when put in hot beverage. Works well and serves it's purpose. Not too flimsy, good price and gets the job done. Kids like to use them as straws because opening is a bit bigger. Coffee stirrers that hold up in the coffee cup; come in a good size quantity and don't break when stirring. Our customers are very pleased with these stir sticks. Stirrers are perfect size for our cups - they don't fall down into no man's land after you stir! The price is right on point, too. These are very sturdy and a good length. They also make great hor d'oeurves skewers when cut in half diagonally - two uses for one product! I like them. You can not beat the deal. The only complaint I have is that people tend to take several for their coffee. For this reason I will likely stick to the wood one in the future. That said still a killer deal! These stirrers are perfect for twelve ounce and above cups. It is almost as long as a standard straw so it's perfect for larger cups. These black stirrers are great for all sorts of mixed drinks in rocks glasses or other small glasses! Nice for offering with hot coffee or tea too!!!! These black stirrers work just as well as the wooden stirrers and they come at a slightly cheaper price. We use both. This is a quality product. These black stirrers are perfect for any rocks or high ball glasses. They are skinny so you can store a lot of them in a compact space.